The American Museum of Magic in Marshall, Michigan kicks off their new season this month. Along with a host of Spring activities, the museum has launched a book club with the first selection being Don Bell's The Man Who Killed Houdini. This groundbreaking 2004 study investigates the life and mysteries behind J. Gordon Whitehead, that McGill University student who punched Houdini in his Montreal dressing room on October 22, 1926. The American Museum of Magic is located at 107 E Michigan Ave, Marshall, MI. Many Houdini artifacts are on permanent display, including a Houdini-Hardeen Milk Can and Houdini's original overboard box. You can keep with the latest via their official website and Facebook page. The Man Who Killed Houdini can be purchased on Amazon.com. 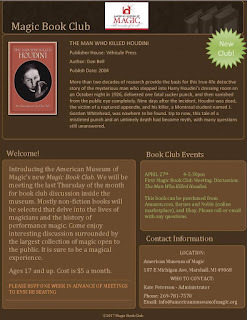 Click the image above for details on how to join the American Museum of Magic book club.